This bold 7 X 10-inch window sign is ideal for any pro-gun business. It clearly communicates that concealed carry is not only permitted on the property but ENCOURAGED! Apply to the inside of windows and doors, viewable from the outside. Show every single customer who walks through your door that you support the right to keep and bear arms! These little 3.5 X 4.5-inch window decals are perfect for pro-gun businesses and homeowners alike. 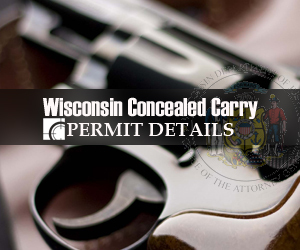 Get the message across that concealed carry is not only permitted on the property but ENCOURAGED! Apply to the inside of windows and doors, viewable from the outside. Show every single person who approaches your door that they are about to enter a PRO-GUN ZONE. We need your help to fund this program. There are two ways you can help distribute signs: You can make a general donation, which will allow us to provide signs for free to businesses. We will send a sign(s) directly to a business. Or, you can order as many signs as you like, which we’ll send to you as free premiums, when you contribute at the donation levels listed here. We will send the sign(s) to you to post with the business owner’s or management’s permission. 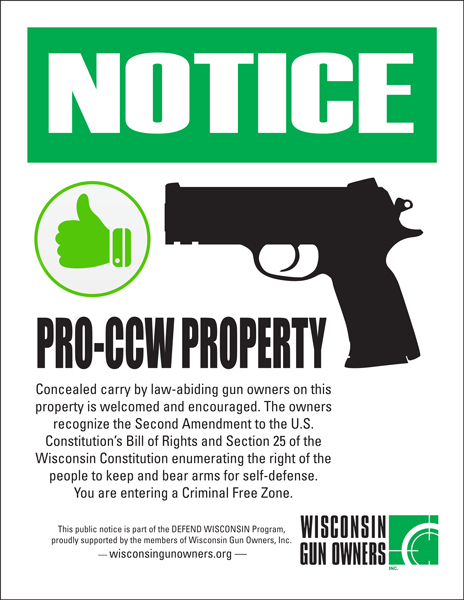 The WGO Pro-CCW Signs are an educational initiative of Wisconsin Gun Owners, Inc. (WGO) and are being sent as a free thank you for the donation amounts listed above. THESE ARE EXTREMELY HIGH QUALITY SIGNS. As such, your contribution is used to pay for the printing and shipping of signs and to continue to expand this important program throughout Wisconsin. As always, be sure to secure permission from any business owner or property manager before posting a sign or decal. 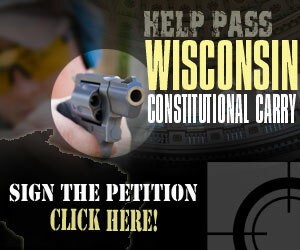 Wisconsin Gun Owners, Inc. is not responsible for the posting of signs by volunteers on property where permission by the owner or management has not first been secured. Thank you for your support of this vital program.